20 Year old Ryan Jai, who is from Kilkenny Ireland, has submitted a song as a Swiss entry for the Eurovision 2016 and is asking for support from Irish people at home and abroad along with other music lovers, to vote for him through the online voting system that will see a number of acts selected to go through to the live shows on Swiss television early next year. A unique online voting system in Switzerland that allows people across the world to vote for a song and singer to represent their country in the 2016 Eurovision is one that a young Irish man is grasping with both hands to make it onto the world stage. Ever the performer, Ryan Jai started writing his own songs at about 13 years old and it was only when he entered one of his songs in a development programme that visited his school, was the quality of his work and performance soon realised. In the two years since winning a YADA Award, he has already come to the attention of top players in the music industry, from Major Label A&R in the US to being offered a place on the live shows of the Voice, which he graciously declined to pursue other avenues. Ryan who by his own admission, hadn’t ever given much thought to the competition route to advance his career, took the decision to run with it when asked if he would be interested in putting down a vocal on a song called Echoes, which was written by a fellow Kilkenny man Oisín, while living in Switzerland. As Ryan is due to do some dates in Switzerland and Germany in 2016 to promote his forthcoming EP, he saw it as a great opportunity to raise his profile both there and at home and recognizes the competition as a huge platform to market himself and his music to a worldwide audience. The 1st stage of the selection process starts on the 2nd Nov and runs to the 16th with the online voting. During these dates the general public across the world can cast 4 votes for one or more acts. A number of successful acts will then go forward to the live show on Swiss television in February where a panel will then select one act to represent Switzerland in the 2016 Eurovision in Sweden. Switzerland is one of only a few, countries who allow other Nationalities represent them in the competition which affords an opportunity to acts outside their own country to break it in the music industry. 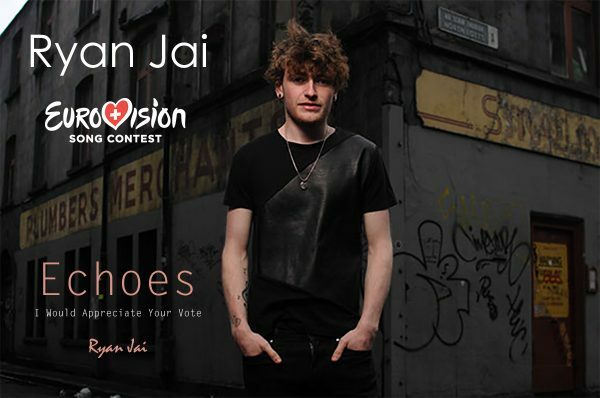 With an extensive Irish community across the world, Ryan Jai is hoping that he can rally enough support from at home and abroad to get him across the line and he is gratefully asking people to visit his facebook page www.facebook.com/ryanjaimusic, give the page a like and follow the link provided there, which will direct them to the voting page, where they can cast as many of their four votes for him as they would like.